The search engine giant Google announces that it will build ultra high-speed network to bring a next-generation web experience to the community, choosing Kansas City, Kan, as the first place that will get its new ultra-fast broadband network. The company announced Wednesday on its official blog that Kansas City would be the first city to get the new program, called "Fiber for Communities." Why Kansas City, Kansas, chosen the first place to get new ultra-fast broadband network..? To work closely with local organizations including the Kauffman Foundation, KCNext and the University of Kansas Medical Center to help develop the gigabit applications of the future. 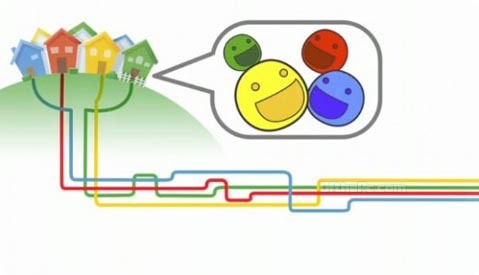 Google announced that the city would be the inaugural site for its "Fiber for Communities" program, which it says will be capable of delivering Internet access more than 100 times faster than the home broadband connections provided by phone and cable companies across the U.S.
Google's service, which will provide Internet connections of 1 gigabit per second to as many as 500,000 people, will be offered in early 2012 while the company looks at other communities across the country. The company said that its plans to offer the service "at a competitive price to what people are paying for Internet access today."